I have written a political book not because I am an expert but because I am a citizen. Subtitled “On the Dismantling of American Culture”, this is David Mamet’s acceptance of hard-earned wisdom, and his argument in favor of the rest of us accepting it as well. Nothing is free. Everything is a trade—everything is a compromise. The error of the left is a deliberate ignorance that short term actions have long term consequences. And, more generally, a deliberate refusal to accept the concept of cause and effect. Leftists go out of their way to show the corruptibility of politicians—and then argue in favor of giving government more power. The politicians and bureaucrats discriminating between claims will necessarily favor those redounding to their individual or party benefit—so the eternal problem of “Fairness,” supposedly solved by Government distribution of funds, becomes, yet again and inevitably, a question of graft. The product for which the spectators are paying is a fair contest, played out according to mutually understood and agreed-to rules. For though it seems they are paying to see success, they are actually paying for the ability to exercise permitted desire, and so are cheated, even should their team win, if the game is fixed. To fix the game for money is called corruption, to fix the game from sentiment is called Liberalism. What greater act of colonialism than to bind a segment of our own population to shame and poverty through government subsidy and by insistence that they be judged by lower standards than the populace-at-large? Mamet’s book reads a lot like Peter McWilliams Ain’t Nobody’s Business if You Do. In McWilliam’s case, the recognition that the love affair of the elite with government was wrong came from his cancer, and he never fully came to grips with it. Mamet has studied and has tried to understand Milton Friedman, Thomas Sowell, and Friedrich Hayek, among others, and also read the competing views of people like Noam Chomsky and Susan Sontag and Frantz Fanon. He borrows heavily from Thomas Sowell and his Vision of the Anointed—the sense of the political elite that intentions matter more than logic and nature, and the corollary that failed polices simply need better intentions—that is, more taxes and more coercion—to overcome the evil intentions of the conservative hoi polloi. The philosophy of the left is not, in fact, a love of, but a rejection of wisdom. And it is contrary to common sense. Liberalism is a religion. Its tenets cannot be proved, its capacity for waste and destruction demonstrated. But it affords a feeling of spiritual rectitude at little or no cost. Central to this religion is the assertion that evil does not exist, all conflict being attributed to a lack of understanding between the opposed. You can get this in more depth and clarity by reading Sowell. What’s interesting about Mamet’s book is that it is the viewpoint of a man whose eyes and mind have recently opened. …the class had ticked over into what I recognized was a usual stage of progression; someone had taken the high ground and shouted “racist,” or “homophobe,” first and loudest, and all who did not wish to be so branded must submit to his dominance, for did he not speak in the name of all the Good? 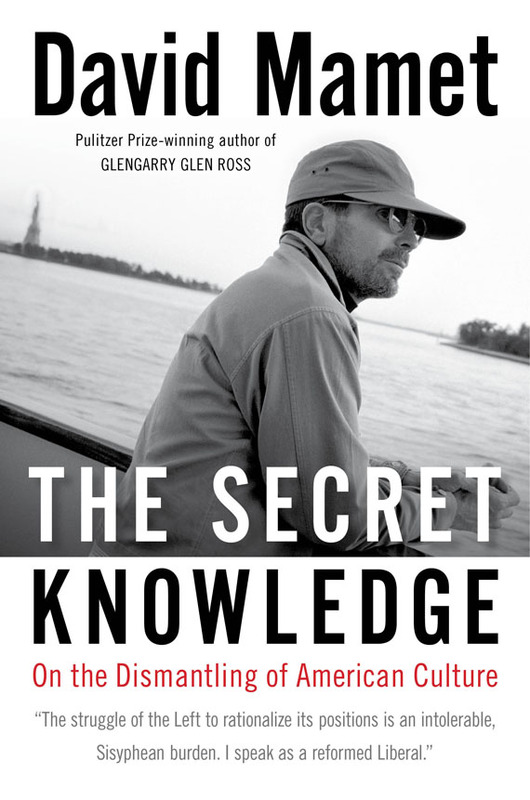 His realization that there is no “hidden knowledge which will spare us toil and grief” and that those who promise it are con artists and purveyors of misery—destroyers of the American dream of equal opportunity—is a fascinating journey and well worth the read—but do remember to follow up and read his sources as well. If you enjoy conservatives, you might also be interested in Essential Revolution: The Return of the Republicans and Institutional memory in political campaigns. If you enjoy David Mamet, you might also be interested in The Spanish Prisoner and Wag the Dog. Peter McWilliams died in defense of freedom: this book, an incredibly well-written and well-researched book about “the absurdity of consensual crimes in a free society” was probably his death warrant. The Secret Knowledge last modified February 23rd, 2014.